I tried on a size XL which is my size in most jackets. The suit is roomy, but it is made to provide ample room under the suit for your street clothes and/or warm layers. Personally I’d have plenty of room for whatever I might wear underneath. My advice on choosing a size would be to match up as many measurements from your own body to Klim’s size chart and make an educated choice of size. With a full suit like this, you’ll be choosing the size that gives the best compromise to your body measurement because most people won’t find an exact match for ALL body parts (chest, height, waist, inseam, etc). If you find yourself between sizes, I’d suggest choosing the smaller of the two since the fit seems to be on the roomy side. I wouldn’t recommend up-sizing for wearing over clothes due to the built in roominess. 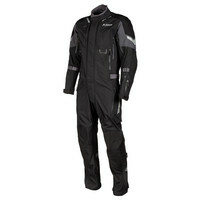 If ever there was a company to take on the formidable task of making a one-piece touring suit, it would be Klim. And here it is for 2019, the Hardanger 1 Piece Suit. This suit us full waterproof with the best Gore-Tex technology and fully laden with D3O armor. And it’s fully kitted with pockets, vents and easy entry zippers. It’s VERY heavy duty gear. First, the name… you’ve got to know how to say it before you can wear it, right? From the references I found on the internet, I think you pronounce in like harbinger but with a “dinger” instead of “binger” and put a slight “a” sound for the “i” in dinger. Have a listen here. The name comes from a scenic area in Norway… and when I say scenic… I mean SCENIC! Have a look here. And now that you are blown away by the namesake, are you ready to spend about thirteen hundred large on the best riding suit in the store? I thought so, ha. Klim is unique among the brands we sell in their frequent use bonded Gore-Tex technology. MANY of their pants and jackets use Gore-Tex materials like is used in this suit. When many people think of GoreTex they envision a waterproof barrier sewn into garments, but in recent years, GoreTex has offered their “bonded” waterproofing technology in motorcycle gear. “Bonded” means the abrasion resistant fabric is directly bonded to the GoreTex waterproof membrane to produce a durable, abrasion resistant, waterproof and breathable garment. In a full suit, it really would be darn near impossible to make something usable in separate layers. Klim, being so experienced with these fabrics have put it all together in this suit. This suit has zippered vents to help with climate control in warmer weather. I’ll refer you to the list of vents on the suit (above) to get the idea. Also, have a look at our photo gallery. The vents all open and close with waterproof zippers to maintain the waterproof characteristics of the suit when closed up. And when the zippers are open, the air passes directly through to your body. Climates vary greatly for our customer base, so I can’t make any blanket statements about usable seasons, but I think the suit would work in the summer months in wet/mild/coastal area, but might be warm in warmer areas of the country. But one thing I can say is… in comparing this suit to the VERY FEW other full suits like this on the market, I think it would compare favorably with regard to venting due to the direct vent feature. For crash protection Klim offered their D3O units for elbows, shoulders, hips and knees. The D3O back pad is included as well so there is nothing else to buy. Each armor unit is fitted into a fabric pocket and the pocket is anchored to the inside of the suit with Velcro. The Velcro area is generous so you will be able to move the armor up/down and side/side to best fit your body. The armor used in the suit is the “vented” type from D3O which is molded into a honeycomb shape to improve air flow. The main entry to the suit is with two main zippers. On the right leg, there is a zip going from the end of the leg to the crotch, and then on the left leg, there is a zipper that goes from the leg end to the crotch and then all the way up the front to your neck. This setup is generally accepted as the best way to build a suit like this so you can literally “step in” to the suit with street clothes and even boots on. This facilitates easy use for commuters.. When you first try the suit, notice that the LONG zipper doesn’t completely disengage at the top or bottom, but rather you just bring both zipper cars together somewhere near the crotch and then you’ll put your legs in first, run the two leg zippers down and then slip into the jacket part. At first, it seems clunky, but with practice, it gets much easier. As you might expect, there are a lot of storage options with this suit. There are six zippered pockets on the front chest and thighs, there is one pocket inside near the breast which has a pass-through for your headphone cords and then there is a little short zip pocket at the end of the left sleeve for your license, etc. And inside you’ll find a hidden pocket on the back side of the back pad, which took me a while to locate even though I knew where it was! Other things I think are nice: the large steel ring on the front of the suit is an anchor point for a lock so you can secure the suit to your bike, there is a key chain lanyard built into the upper left chest pocket, both collar ends have loops to hold them back from your neck if you want to zip down the neck opening a bit (for comfort or to get some air), and sturdy fit adjusters on the arms torso and legs. I also like the extra heavy duty patches on the shoulders elbows and knees to beef up those areas. Having something extra on the knees is handy because I often find myself kneeling down on the ground for one thing or another on a trip. Held says: The Hardanger is KLIM’s first fully armored, weatherproof one-piece engineered to be right at home on an epic long-distance journey or your daily commute. Fully featured and streamlined yet durable, this one-piece provides high levels of protection and comfort. Industry-first integration of D3O® LP1 vented armor system offers high performance impact protection while providing unprecedented ventilation.